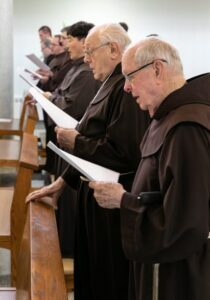 Brothers of the two Franciscan provinces in Canada (St-Joseph and Christ the King) gathered for a Chapter of Mats in Québec from April 23 to 26. The meeting, whose theme was Revitalization and Evangelization: Go and Rebuild My House, was held at the Ursulines’ Centre de spiritualité in Loretteville. 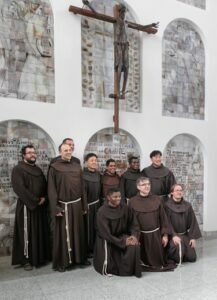 The aim of the chapter was to give the brothers of the two provinces an opportunity to get to know each other and to talk about the fundamental values that inspire their life, as presented in the Order of Friars Minor document Ite Nuntiate. According to Br. 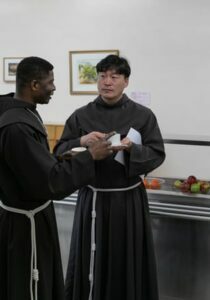 Pierre Ducharme, vicar of Christ the King province and a member of the organizing committee for this chapter, the goal was achieved: “I sensed a profound fraternal spirit among the brothers who were present,” he said. 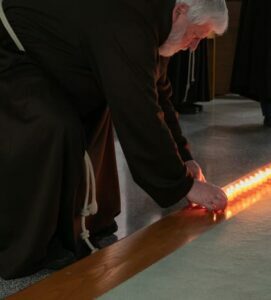 Although this chapter was meant to be a time of privileged encounter so the brothers could get better acquainted, it is important to recall that this meeting was also one of the steps leading the Canadian Franciscans to a Chapter of Union, which will take place in Edmonton from October 21 to 25. Br. 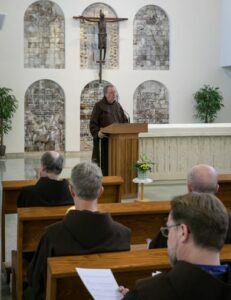 Peter Williams, who served as general delegate in the process of union, began his presentation of the agenda for the Chapter of Union by reminding the brothers that “we are always en route, trusting that the Lord is guiding us.” He also said that it was not only a unique experience for the two Canadian provinces, but an important one for the Order of Friars Minor as a whole.